As 2015 draws so an end, so does the anime season. In the coming week or two, we’ll give our reviews for Fall 2015 anime, but today, we’ll wrap up the year by giving our selections of the year’s best anime. Kaze, Japes, and myself give our top five picks below, and we also have a consensus ranking from our bloggers. It took recommendations from three different people for me to finally pick up One Punch Man, as I had dismissed its plot summary as strange and unappealing. Not only did it sounds unoriginal, I knew that a standard action anime was just not going to be up my alley. Boy, was I wrong. From the first episode, I knew that One Punch Man was going to be a fun show, but I didn’t realize just how fun! The show’s ability to maintain its absurd level of humor, all while gradually amping up the stakes and mixing in heartfelt character development, backed by high production values (particularly in the animation department, thanks to Madhouse) resulted in a fantastic production that I just know I’ll be revisiting some time next year. If you haven’t watched it yet, you have to at least give it a try! I always have trouble coming up with a best of list as my objectivity and subjectivity clash, and I can never find an agreement with myself. If you ask my this question, my answer will differ every time, but I think some of these are the more consistent titles I would give. 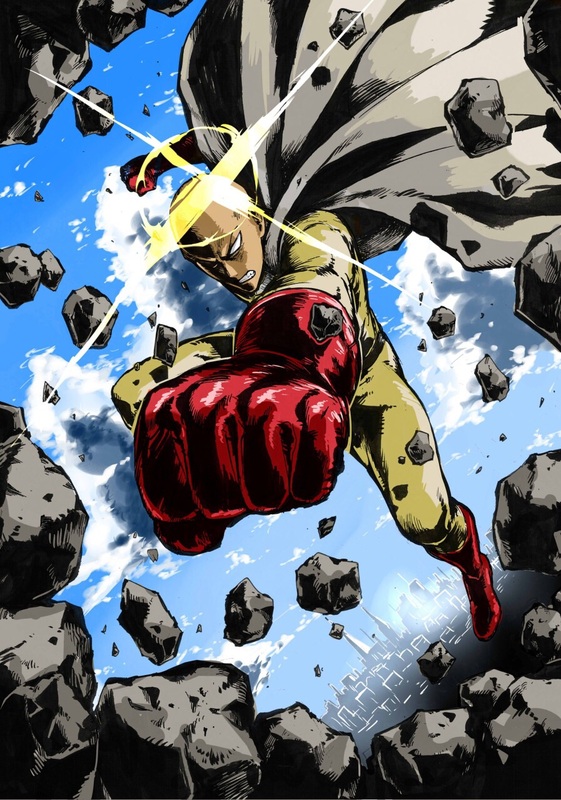 One Punch Man has some bias due to airing recently, but it was still an excellent adaptation of the manga/web comic. Although there were definitely scenes that could’ve been done better, it still managed to prove my pessimistic worries about the adaptation wrong. The latter half of Jojo continued to be great fun, with the most memorable finale of the year being pretty much perfect. I still can’t find myself to enjoy the “monster of the week” formula, but some of the battles were unique enough to maintain my interest with each week. NNB comes in a 3, where it continues to be the most iyashikei anime we’ve had in years. I loved every episode with its serene atmosphere and rustic lifestyle. I’m happy to see that Japes has finally seen the light of the nyanpasu. I have mixed feelings about putting Shokugeki no Souma at number 4. It is really a strange example for me because as I’ve said before, it never really did anything that great; it just never did anything bad either. It did a superb job of maintaining excitement and suspense without relying on any silly gimmicks, yet still with all the tropes of a generic shounen. It was an excellent adaptation of the manga, and I look forward to its second season next year. Finally, Gochiusa comes in at number 5 for the very simple reason of cute girls doing cute things. Granted, we get a lot of those anime, but this had cute girls doing extra cute things, so I think that justifies its higher ranking. With my list, I at first felt like I would give a more populist ranking than Kaze’s and Japes’. But, it’s not really that. 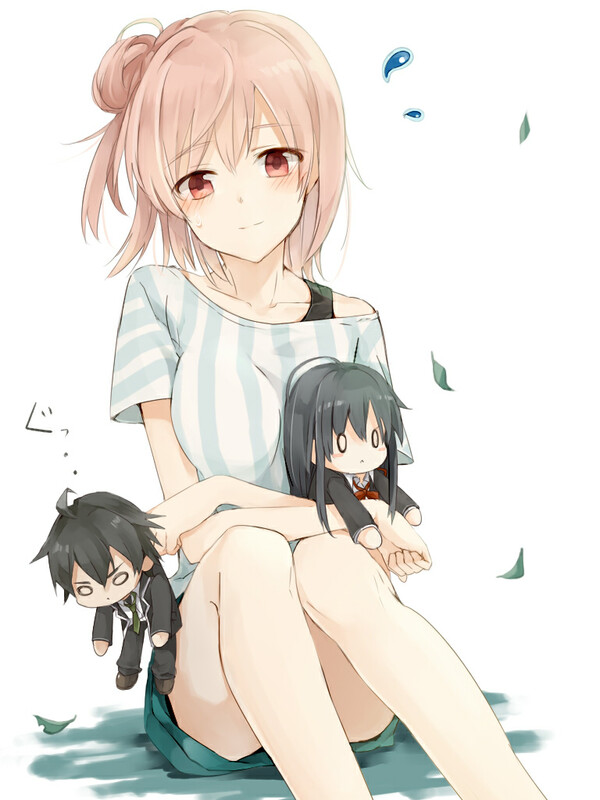 I haven’t seen nearly as many series this year as either, but I’ve been lucky enough to see six or seven series that I have no hesitation in saying are among the best this year – and it starts with OreGairu. Adding a new major character to a show is often a recipe for disaster, but OreGairu managed to do it this season and make an already strong show even stronger. The insertion of Iroha into the series only helped make it more angsty (in a good way), while pushing the main characters to become more “genuine,” to face reality and get out of the shells they’ve made for themselves. OreGairu has THE BEST internal dialogue of any anime series I’ve ever watched, dialogue that isn’t developed for cheap exposition but which is a highlight of the show itself. Meanwhile, the season hit a lot of emotional highs, showing me that in a short time, I’ve come to care about this cast of characters that I don’t necessarily know super intimately (as they don’t even know themselves too well). Shirobako‘s second cour was excellent, like the first. It was my Chihayafuru this year – a sneaky good show that I found myself anticipating each week. Noragami was the big shocker this year for me, with a far superior second season that had depth and created real suspense, and had me forgetting the terrible ending to season one. Death Parade had high ambitions, and mostly delivered; each episode felt like a series unto itself, worthy of exploration and reflection. And wrapping up my top five is Your Lie in April, a show with a ton of faults but a surprising amount of depth, and one that followed a plan from beginning to end. The second cour handled the show’s climax well and resolved in a strong manner – not an easy task for a series built upon such an emotional premise. So that it’s for 2015 anime! In a few days, it’ll be 2016, and in a few days more, we’ll have a new season of anime to gush about (or hate on). Here’s to hopefully another year full of wonderful series! I really like that so many of you mentioned NNB. That show is wonderful. I’d have to say that my favorite show this year was probably Charlotte though. I’m surprised that none of you mentioned it! Yeah, I absolutely loved NNB! Kaze and I have very strong (negative) opinions towards Charlotte, but I’m also surprised that Charles didn’t mention it! It does if I have anything to say about it! I love Non Non Byori, it’s great comfort anime. It took me an episode or so to figure out that Repeat was covering the same time period as the first season(with different stories), which blew my mind a bit. Just another reason why anime is so singular & awesome. Sound! Euphonium is a soon-to-watch show for me, sounds interesting! Sounds like you share tastes with a number of the Tangles staff! NNB was definitely a favorite of mine, and I’ll probably be revisiting it at some point down the road. Check some of stardf29’s articles for Sound! Euphonium! He’s a huge proponent of the show! Non Non Biyori is one of my all time favorite shows, and Repeat is basically perfect (I gave it a 10 on MAL). Awesome to see some love for it on here! I think if I watched it again and gave it some more time to marinate, my score for it would go up as well! Either way, an 8/10 by my rating standards is super high!